Nutrition is very important for every golfer. If you follow a diet chart you can make a whole lot of difference in the Golf yard. So here we are presenting you the best food chart for a golfer. We are going to discuss every single top menu for golf nutrition. We are going to tell you how to set up a golf nutrition plan . What to eat during training? What to eat before the course? What to eat during a golf course and what to eat in order to repair your body after the course and what not. Golf Round, typically a golf round takes 3-5 hours depending on the numbers of hole and skill of the golfer. Ever found yourself praying for the halfway hut to be open? Even it’s only the 3rd round. Having a feeling like you just had finished the 3rd world war once you reach the 18th? Well if found something similar above then we know the answer, why? Playing golf can burn a lot of energy, near to 2000 calories per round. If you are not eating the right amount of healthy food, you will find yourself exhausted and tired in the very first round. Nutrition is Important for every single human being in the world and for the players, it now needs to explain the importance. For the golf player, it’s really important to maintain the energy balance in the body to give the best out of him. Unlike other games, golf is played by a Huge amount of time and player must prepare them self and choose the best food before the game, during the game, and after the game in order to bring out the best performance. During a round one player has to walk a long way. He has to take a lot of mental and physical decisions and energy drains out fast. To keep up to the game you have to eat and drink properly. 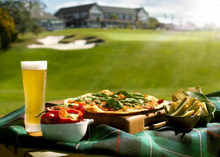 Now let’s talk about the best food choice during a round of golf, hole by hole and with nutrition fact. Let's start with the training diet. While you are training you must be very careful when it comes to your food. If you can maintain some basic rules of eating, you can save yourself a lot. Eat less fat and sugar, don't skip your meal and drink a plenty of water. Fruits, nuts, and vegetables are your friends so don’t forget them either. Usually, a golfer takes his pre-competition meal 3-4 hours before the match. Be very wise full when you choose the food, you have to choose the correct food. This will prevent you from hunger and keeps you up for the day. Carbohydrate, protein, and fluid to rehydrate your body. - Tuna with sweet potato. - Multigrain bread with cheese or chicken. - Fresh fruit, salad, yoghurt. These can be very good choices for the meal before the competition. Hydrate your body- The vast majority of our body is made out of the water and there is no need to tell the importance of water in your body and while the play you dehydrate really fast, which can lead you to lack of concentrate and performance. Which ultimately affects your game, so keep drinking don’t keep yourself thirsty. Hole 4 – you will need a lot of carbohydrates, good fats, Protein for energy. The best food for that nutrition, you can always go for a Cereal Bar, almonds or banana. They maintain the proper amount of fat, carbohydrate, and protein. Which keeps you up for the game and you stay healthy. Hole 8- Chicken role, yes a chicken role can do the work for you at the 8th hole. Also, multigrain bread can help you to achieve a fast digestion but plenty of protein and carbohydrate. Hole 12- bananas and nuts/seeds, bananas release energy quickly perfect for your 12th hole and nuts or seeds can do the perfect job at the time. Almonds, raisins or trail mix can fix your hunger and bring the charm for your remaining game. In order to recover the strength and energy, you have lost during the game. It is a lot more than your body now, to refuel yourself you need to cheer up your body and your soul. Take a hot shower, do some stretching and goes on. For the food same thing works here also. You can take one-fourth of your daily requirement of protein. For example, a turkey sandwich, some almonds/nuts with fruit juice and fresh fruits are always the stars. Keep drinking water through the whole game, just take a sip and stay hydrated round the game. After the round, your body needs to repair. You should eat a lot of vegetables and fresh fruit, Chicken wrap, Cottage pie or salad. Most importantly a nice sweet sleep can bring the balance of your body. There are some food suggestions which can help you to maintain your nutrition as a golfer. Fruits are a good source of carbohydrate and nuts are full of good fat. The slow digestive process will help you to keep yourself together in the best way. Don't forget your source of protein always choose the best food for your protein. Eat less fat and eat good fat instead and don't forget your water for rehydration. Don't skip your meal or sleep to stay healthy and fit. Always remember “a stitch in time saves nine". Overall the fact is undeniable that the golf nutrition during a golf round can make a vast change and sometimes it can change the whole the game, so golfers, are you ready? Are you up for the next game? Keep eating healthy and fresh, be happy!